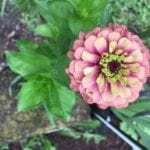 How to keep zinnia healthy? I started a zinnia garden from seeds. They grew up tall and there were a lot of stems, not as many flowers as stems. But when the flowers started coming in I noticed the leaves are riddled with small brown holes. Also many of the stems on the outskirts are falling over and the garden is not as full as when it started.I'm deadheading but still not getting a lot of blooms.I'm worried about maintaining the garden so it will be around next year. Your zinnias are planted too close together. This blocks sunlight from reaching the entire plant and it reduces air circulation. Both make disease more common. From the picture, the lower leaves are mostly gone because light could not reach them. That reduces photosynthesis, the plants source of energy. The result is they grow rapidly but weakly trying to reach more sun. I would take pruners and snip at ground level at least half of your plants. If you have the seed pack or know the cultivar, you can look up how far apart (the spacing) is recommended.